Seems like USD/JPY bulls are hiding ahead of the Fed’s much-awaited event. Time to lock in some profits! If you’ve just tuned in, you should know that a few weeks ago I risked 0.50% of my account to jump on USD/JPY’s uptrend. While 110.10 was not the perfect entry, I banked on the dollar being the “cleanest shirt in the laundry pile” to push USD/JPY’s trend higher. Fast forward to today and USD/JPY’s rally is contained by the 111.70 mark even as it finds support at the 100 SMA on the 4-hour chart. It also doesn’t help that analysts are expecting the Fed to be a bit less hawkish than they were earlier this year. Aside from expecting the Fed’s “dot plot” to reflect fewer rate hikes, some also see Governor Powell and his team downgrading their economic forecasts and justifying their call for “patience” by pointing out the downside risks to the economy. This is why I’ve decided to adjust my stops to 110.15. The level is below the 100 SMA and mid-channel support, so I think it should be enough in case we do see volatility during the Fed’s event. It’s a waiting game for me from here! I now have a risk-free trade, but my fingers are still crossed that traders will focus more on the Fed’s optimism! Can USD/JPY Extend Its Uptrend? Can USD/JPY extend its uptrend over the next couple of trading sessions? Here’s the forex setup that I’m watching this week. Hey guys! Who’s looking for the dollar to extend its gains against the yen? If you are, then you’d definitely want to see this setup. 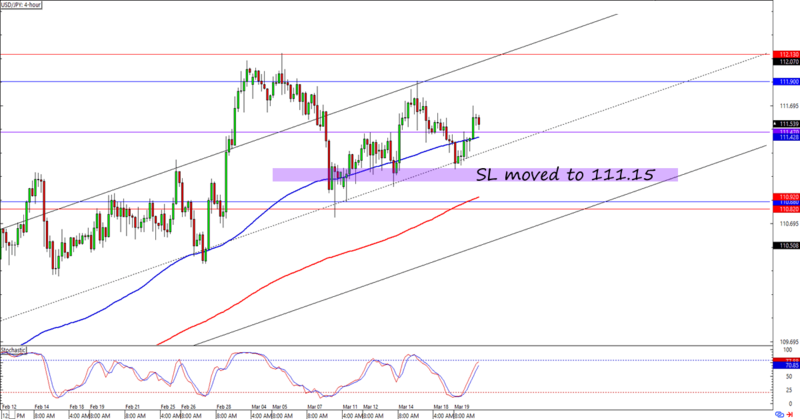 Can USD/JPY Extend Its Uptrend? – Orders In! Who else is watching USD/JPY? After weeks of watching its uptrend, I’ve finally put in my orders! Here are the deets. With the BOJ’s decision around the corner and USD/JPY reacting to a psychological level, I’ve decided to tighten my stops a bit.